and Prakash Shetty is Chief of ESNA. The most recent estimates from FAO indicate that 840 million people do not receive enough energy from their diets to meet their needs. The overwhelming majority of these people - 799 million - live in developing countries. The global toll of people affected by micronutrient deficiency is estimated to be even higher and probably exceeds two billion. Micronutrient deficiencies can exist in populations even where the food supply is adequate in terms of meeting energy requirements. In these situations, people are not considered "hungry" in the classical sense, but their diets may be grossly deficient in one or more micronutrients. Blindness and goitre are two of the most visible external manifestations of micronutrient defi ciency, and have helped to bring it into the limelight. However, they represent only a fraction of the problem, and subclinical deficiencies afflict a much larger proportion of the population. Today, the consequences of subclinical deficiency are becoming better understood and monitored, but they often go unnoticed within the community in spite of their insidious effects on immune system functioning, growth and cognitive development. It is for these reasons that micronutrient deficiencies have been referred to as "hidden hunger". Micronutrient deficiencies are most prevalent in areas where the diet lacks variety, as is the case for many individuals in developing countries. When people cannot afford to diversify their diets with adequate amounts of fruits, vegetables or animal-source foods that contain large amounts of micronutrients, deficiencies are inevitable. In addition, a minimum amount of fat or vegetable oil is required in the diet for adequate absorption of the fat-soluble vitamins A, D, E and K.
Grave consequences, including continued and sustained loss of productivity, permanent mental dis ability, blindness, depressed immune system function and increased infant and maternal mortality can result from micronutrient deficiencies. The heaviest toll from these dietary deficiencies is borne disproportionately by women and children. Death and the disabilities caused by micronutrient deficiencies need not occur, because there are several short- and long-term strategies that can be employed to prevent the development of these deficiencies. Many actions can be undertaken by the communities them selves, once they recognize and under stand the problem. This article provides an overview of the global prevalence of micronutrient malnutrition and discusses approaches that may be used to address the situation while emphasizing the role of food-based strategies favoured by FAO. Micronutrients are the essential vitamins and minerals required by human beings to stimulate cellular growth and metabolism. Nineteen vitamins and minerals are considered essential for physical and mental development, immune system functioning and various metabolic processes.1 Deficiencies of iron, iodine and vitamin A are the most widespread forms of micronutrient malnutrition with public health consequences. Other micronutrients have been shown to play a role in preventing specific disease conditions (e.g. folic acid and calcium) or in promoting growth (e.g. zinc). The global prevalence of zinc and folate deficiency has not yet been established, but it is predicted to be significant, as micronutrient deficiencies rarely occur in isolation. One reason is that deficiencies usually occur when the habitual diet lacks diversity or is overly dependent on a single staple food, as is the case with monotonous cereal- or tuber-based diets (FAO/WHO, 2002). Situations of food insecurity, where populations do not have enough to eat, will also inevitably result in micro nutrient deficiency. Iron, vitamin A and iodine def i ciencies are the three micronutrient deficiencies of greatest public health significance in the developing world. Anaemia is defined as a reduction in the oxygen-carrying capacity of red blood cells, which occurs as a result either of decreased haemoglobin or of a reduction in the total number of red blood cells (i.e. a decline in red blood cell mass). Iron deficiency is the most common cause of anaemia, although anaemia can also occur as a result of vitamin B12 or folate deficiencies, con genital hereditary defects in red cells, reproductive blood losses, or from infection by malarial parasites or infestations of the gut by parasites such as hookworm. The level of haemoglobin in the blood is the most commonly used indicator to screen for iron deficiency anaemia (IDA), and is thus the indicator for which there is the most data worldwide. The true prevalence of iron deficiency in a population, however, will be larger than the level of clinically detectable iron deficiency anaemia (WHO, 2001a), because most individuals are likely to be iron deficient long before there is a detectable drop in blood haemoglobin levels. Nutritional iron deficiency, or habitual iron intake that is insufficient to cover requirements, is the most common cause of iron deficiency (FAO/WHO 2002). Dietary sources of iron are present in two forms, haem and non-haem iron. Haem iron, found in animal-source foods such as meat, poultry and fish, has greater bioavailability than does non-haem iron, found in cereals, pulses, fruits and vegetables. There are many dietary factors that can either inhibit or enhance absorption of non-haem iron. Iron absorption is inhibited by phytate, found in whole grains, seeds, nuts and legumes, and by the phenolic compounds (tannins) present in tea, coffee and red wine. By contrast, iron absorption is enhanced when consumed with ascorbic acid, present in many fruits and vegetables. Iron deficiency becomes more common when an individual's iron requirements are increased owing to physiological demands such as pregnancy, menstrual loss or periods of growth, or when iron is lost because of parasitic infections (hookworm or malaria). As a consequence of these compounding factors, people living in environments prone to infection from malaria and hookworm, and whose habitual diet is high in phytate with few animal-source foods are more likely to become iron deficient. IDA is considered as a micronutrient deficiency of public health significance not only because it is widespread, with an estimated two billion persons affected worldwide, but also because of its serious consequences in both adults and children. IDA is more prevalent in women than in men, and is also prevalent among children and the elderly. IDA during pregnancy can result in serious consequences for both mother and baby. Iron-deficient women have a higher mortality risk during childbirth and an increased incidence of low-birth-weight babies (WHO, 2002). Figure 1 illustrates the prevalence of IDA in pregnant women. Southeast Asia shows the highest prevalence of anaemia in women, with over 50 percent of pregnant women affected (Mason et al., 2001). In addition to the effects of anaemia during pregnancy, much more is now known of the deleterious effects of anaemia on the cognitive performance, behaviour and physical growth of infants and children of preschool and school age (WHO, 2001a). IDA in adults diminishes their stamina and work capacity by as much as 10-15 percent, and it has been estimated that this deficiency provokes losses in gross domestic product of up to 1.5 percent (FAO, 2002). Iodine is an essential mineral required by the body to synthesize thyroid hormones, the most important of which is thyroxine, a metabolism-regulating substance. The iodine content of plant foods is heavily influenced by the presence of iodine in the soil or environment. Seaweed concentrates iodine from seawater and therefore constitutes a rich source of this nutrient. Seaweed and seafood, in general, are good dietary sources of iodine. Eggs, meat, milk and cereals also contain small amounts of iodine. Populations with little access to ocean fish or other marine products, for example persons living in mountainous areas, are the most likely to show iodine deficiencies resulting from a lack of natural dietary sources of iodine. Clinical iodine deficiency is detected by the presence of goitre (swelling of the thyroid gland). Subclinical iodine deficiency can be detected by measuring urinary iodine or assessing thyroid function. 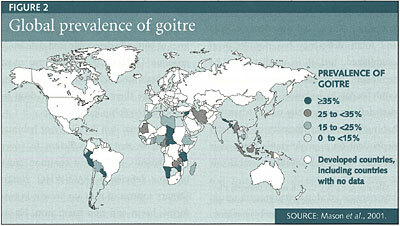 Figure 2 shows the global prevalence of goitre. The latest estimates indicate that 741 million people, or 13 percent of the world's population, are affected by goitre (WHO, 2001b). As with IDA, the true prevalence of iodine deficiency is even more widespread than the numbers of those affected with goitre would seem to indicate; however, there are no global estimates for prevalence of low urinary iodine, which is the best subclinical indicator. The most devastating consequence of iodine deficiency is reduced mental capacity. Fifty million people worldwide are mentally handicapped as a result of iodine deficiency (WHO, 2002). According to one source, it has been estimated that 100 000 children are born each year with irreversible brain damage because their mothers lacked iodine prior to and during pregnancy (ICCIDD, 2002). Maternal iodine deficiency can also lead to spontaneous abortions, stillbirth and impaired foetal development. In infancy and childhood, this deficiency is manifested by poor mental development and growth defects. Persons living in communities with endemic iodine deficiency may show an intelligence quotient 13.5 points lower than persons from similar communities with adequate iodine supplies (WHO, 2001b). Iodine deficiency is the most preventable cause of brain damage and one of the easiest disorders to prevent: it suffices to add small amounts of iodine to frequently consumed foods such as common table salt. Vitamin A is required by all body tissues for normal growth and tissue repair. The visual and immune systems are particularly dependent upon this vitamin for normal functioning. Vitamin A in the form of retinol is present in a variety of foods including eggs, milk and fish, or in its precursor form as carotene in yellow fruits and vegetables, green leafy vegetables and red palm oil. Retinol forms of vitamin A are more readily absorbed by the body than carotene, although the bioavailability of carotene can be enhanced by consuming dietary sources of fat at the same time. The efficiency in converting carotene (and other carotenoids) into the active form of the vitamin is now thought to be considerably poorer than previously assumed; this topic is currently an active area of investigation. Blindness resulting from vitamin A deficiency (VAD) has been largely responsible for sensitizing communities and raising international awareness of the devastating consequences of this deficiency. VAD is still the leading cause of preventable blindness in children. However, clinical forms of the deficiency are now becoming less frequent, and detection of subclinical deficiency is gaining more importance (Mason et al., 2001). Optimal vitamin A status is necessary for the immune system to function normally. Subclinical deficiency has been linked to increased childhood illness and death. It is estimated that improving the vitamin A status of children would decrease overall child mortality rates by 25 percent, measles death rates by 50 percent and death caused by diarrhoea by 40 percent (UNICEF, 2002). Previously, the most common indicators used to assess VAD were clinical signs affecting the eye. Collectively known as xerophthalmia, these range from relatively mild, rever sible conditions to permanent blindness as a result of keratomalacia (irreversible corneal damage). Subclinical deficiency can be detected through measurement of serum retinol. This indicator can be used to identify populations at risk from increased morbidity and mortality and can also be used to classify the severity of the problem. The World Health Organization (WHO) recommends that VAD be regarded as a severe public health problem in populations where more than 20 percent of the children have serum retinol levels equal to or lower than 0.7 mmol/l (WHO, 1996). 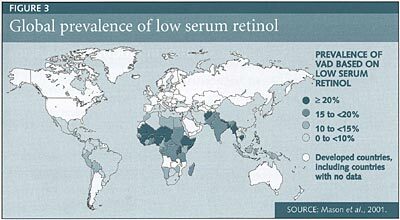 Figure 3 shows the global prevalence of low serum retinol. Deficiencies of the micronutrients vitamin A, iron and iodine are those considered to be of the greatest public health significance. However, much more is now being discovered about the vital role of other important nutrients for growth, development, immune system functioning and prevention of birth defects; zinc and folate are two of these. Zinc. Global attention to zinc deficiency has accelerated rapidly over the past 15 years. However, there is still no information about the prevalence of this deficiency, although it is assumed to be widespread in areas lacking dietary diversity. Zinc is an essential component in over 300 enzymes needed by the body for metabolism (FAO/WHO, 2002). The best dietary sources of zinc are meat, particularly organ meats, and shellfish, while eggs and dairy products are also relatively good sources of zinc. The bioavailability of zinc is inhibited by phytate, which is present in large amounts in cereals and legumes. Thus people whose diet contains only minor amounts of animal-source foods (including dairy products), with large amounts of staple grains and pulses, will be at greater risk of zinc deficiency. Research is emerging on the role of zinc deficiency and the impact of zinc supplementation on pregnancy outcomes for both mother and foetus, and on the morbidity, growth and neuro-behavioural development of children. The clearest indicator of zinc deficiency is stunted child growth; there is evidence that zinc supplementation can improve the growth of stunted children (Brown and Wuehler, 2000). Some benefits in relation to incidence and prevalence of diarrhoea have also been noted with zinc supplementation. Evidence linking zinc to improvement in pregnancy outcomes and cognitive development of children is not strong, and more research is needed in these areas (Brown and Wuehler, 2000). Most importantly, there is a need to develop simple low-cost methods for assessing the zinc status of individuals so that a better assessment of the global prevalence of zinc deficiency can be conducted. Folate. Folate is required for the synthesis of nucleic acids. Deficiency can arise from insufficient dietary intake as well as malabsorption resulting from gastrointestinal disorders and secondary deficiencies of B6 and B12, or iron (Stover and Garza, 2002). Liver is considered to be the richest source of this nutrient; folate is also present in a variety of vegetables. Folate has received con siderable attention for its role in the prevention of foetal neural tube defect, a condition associated with inadequate folate stores in early pregnancy. Thus folate status before conception and during early pregnancy has become the focus of much of the discussion on this nutrient. There is increased risk of foetal neural tube defects if the folate status of pregnant women shifts from adequate to poor (FAO/WHO, 2002). It is for this reason that folate supplementation for women planning a pregnancy and during the first trimester has become a recommendation in many countries. An important distinction to note with folate is that recommendations during early conception are designed to prevent deficiency and are recommended even for people whose folate status is considered adequate. The supplementation strategy in this case focuses on prevention rather than correction of problems. Even though there has not been a large effort to determine the global prevalence of folate deficiency, the FAO/WHO Expert Con sultation on Human Vitamin and Mineral Requirements has recommended that further investigation be conducted into the relationship between folate deficiency and incidence of neural tube defects in developing countries (FAO/WHO, 2002). Micronutrient deficiencies remain a significant global public health concern. Although scientific knowledge is sufficient to solve the problems of micronutrient deficiencies, operational impediments prevent the implementation of solutions. Impediments include lack of political commitment and poor use of resources (Underwood, 1999). A recent report by the Micronutrient Initiative undertook a thorough analysis of trends in the prevalence of the three major deficiencies. This analysis revealed reductions in the prevalence of clinical VAD and significant improvements in goitre rate in countries with substantial iodization programmes, such as Bolivia, Cameroon, Peru and Thailand but virtually no progress in the control of IDA (Mason et al., 2001). However, it is equally important to note the difficulties encountered in estimating the global reduction of micronutrient deficiencies, owing to underestimation in past evaluations, lack of comparable infor mation from one survey to another and improved detection skills in recent surveys (WHO, 2001b; Hunt and Quibria, 1999; Mason et al., 2001). The importance of collecting data on subclinical and process indicators is becoming increasingly evident. Table 1 provides a list of clinical, subclinical and process (or programmatic) indicators for vitamin A, iron and iodine deficiencies. Process indicators are being increasingly utilized to detect programmatic improve ments in control strategies, and are frequently included in nationally representative surveys such as multiple cluster indicator surveys or demographic and health surveys. When systematically collected, these indicators can also be used to demonstrate progress and are often easier to collect than clinical and subclinical indicators. Innovative and multisectoral approaches to controlling micronutrient deficiencies have contributed to observed improvement in the global situation. One of the more successful recent strategies in the control of VAD has been to link the distribution of vitamin A capsules to national immunization days. The United Nations Children's Fund (UNICEF) estimates that 11 countries had vitamin A supplementation coverage rates of 70 percent or more for the targeted population of children under five years of age in 1996, and by 1999, 43 countries had reached this level of coverage (UNICEF, 2001). In the case of iodine deficiency, an estimated 72 percent of households in developing countries now use iodized salt, compared to 20 percent a decade ago (UNICEF, 2001). Three of the main strategies for addressing micronutrient malnutrition are dietary diversification, fortification (including biofortification) and sup plemen tation. Most micronutrient defi ciencies can be effectively addressed through dietary diversification. Fortifi cation strategies are needed in areas where the traditional diet lacks a specific nutrient, such as iodine. Food-based approaches to fulfilling micronutrient requirements have received strong support as a sustainable means of meeting the nutritional needs of population groups (WHO/FAO, 1996; FAO/WHO, 2002). These strategies are discussed in more detail below. Supplementation is a technical approach in which nutrients are delivered directly by means of syrup or pills. Supplementation is most appropriate for targeted populations with a high risk of deficiency or under special circumstances, such as during pregnancy or in an acute food shortage. Under normal circumstances, supple-mentation programmes are used only as a short-term measure and are then replaced with long-term, sustainable food-based measures such as fortification and dietary modification, usually by increasing food diversity. Fortification strategies utilize widely accessible, commonly consumed foods to deliver one or more micronutrients. The most widespread effort to date has been fortification of salt with iodine. However, many other foods may be used as vehicles for a variety of micronutrients. Some of the more common combinations are wheat products (cereal, bread or pasta) with one or more nutrients including calcium, iron, niacin, riboflavin, thiamine and zinc. Milk can be fortified with vitamin D; fruit and fruit juices have been fortified with calcium and vitamin C. Fish sauce and soy sauce are also recognized as good fortification vehicles, and trials are under way to determine the efficacy of these foods as fortification tools (Mannar and Gallego, 2002; Chen, 2003). Successful employment of fortifi cation strategies requires centralized processing facilities, mechanisms for quality control, and social marketing and public education strategies (Nantel and Tontisirin, 2002; Uauy et al., 2002). The required infrastructure is often weak or lacking in developing countries, which reduces the potential for the success of fortification measures. Adequate income and marketing channels are essential if these strategies are to succeed, but the poor and nutritionally vulnerable are frequently less able to purchase fortified food products. Moreover, infrastructure, including roads and transportation systems, is weak in many developing countries. In order for fortification pro grammes to be successful, these issues need to be addressed, particularly in rural and remote areas, where the majority of the populations at high risk live. Consumption of a wide variety of foods, including those that contain an array of micronutrients, is still seen as the best long-term sustainable solution to eradicate hidden hunger. Along the path to achieving this goal, biofortification may help to improve the health and welfare of many populations. Biofortif ication, or plant breeding for the specific purpose of enhancing the nutritional properties of crop varieties, reflects the new application of an ancient technique. For centuries, farmers have bred crops to enhance specific traits such as improved yield, drought tolerance or insect resistance. Recently, breeding trials have been undertaken for the specific purpose of enhancing the nutritional value of crops with the specific objective of improving human nutrition. Gene-marking techniques make it possible for scientists to identify the specific plant genetic material that controls nutrient content so as to select the most beneficial ones for breeding purposes. Using genes that contain nutritionally superior traits has enabled scientists to produce crop varieties with higher nutrient content. There have been some reported successes, including high-protein maize, high-carotene sweet potato and cassava, and iron-enhanced rice (IFPRI, 2002). Dietary diversity can be augmented by expanding the production, processing, marketing and consumption of a wide variety of foods. In treating the problem of micronutrient deficiencies, food-based approaches that focus on improving overall dietary quality, rather than merely delivering a single nutrient, are particularly useful. Several factors lend support to this approach. First, there are complex nutrient-nutrient interactions that increase bioavailability when nutrients are consumed simultaneously. For example, iron absorption is increased when it is combined with vitamin C (FAO, 1997). New evidence about the protective role of phytochemicals and antioxidants continues to emerge. These protective chemicals are easily obtained by consuming a wide variety of fruits and vegetables. Scientific knowledge linking nutrition and disease continues to evolve and expand, implicating an even wider range of nutrients with a variety of roles in health maintenance. Rickets, a disease associated with vitamin D deficiency, has now been connected to diets low in calcium. Demonstrating the existence of dependent relationships heightens the importance of promoting food-based approaches that focus on achieving sustained improvements in the overall diet. There are several low-cost, food-based measures that can be promoted at the community level to improve micro nutrient status, some of which are presented in Box 1. Culturally appropriate dietary modifications should be developed to help people identify con crete actions that can improve both dietary supply and the absorption of micronutrients. This information needs to be disseminated to the public through traditional information channels. Source: Adapted from FAO/ILSI (1997). Developing communities face multiple problems. Therefore focusing on a single micronutrient deficiency or on a single strategy is not the most effective means to eliminate micronutrient deficiencies. The problems often result from a wider set of factors including health care, education, sanitation, water supply and housing (Nantel and Tontisirin, 2002). Comple mentary public health inter ventions that can help reduce micro nutrient mal nutrition include dewormi ng, malaria prophylaxis, im proved water and sanitation facilities and childhood immunization. Successful strategies are those that address all these issues in an integrated and coordinated fashion. Holistic strategies, using a mixture of direct and indirect interventions and public health measures, as well as education and awareness campaigns, have proved to be the most successful in reducing micronutrient malnutrition (Under wood, 1999). Communities themselves are best suited to determine which corrective actions to employ to address their problems. Collecting process indicators at this level can help direct community actions. The role of gov ernment and government counter parts is to support these actions through political commitment, training and the provision of basic services, including attention to micronutrients. Brown, K. & Wuehler, S., eds. 2000. Zinc and human health. Ottawa, Micronutrient Initiative. Chen, Chunming. 2003. Iron fortification of soy sauce in China. Food, Nutrition and Agriculture, 32, pp. 76-82. FAO. 1997. Human nutrition in the developing world, by M. Latham. Rome. FAO. 2002. State of Food Insecurity in the World 2002. Rome. FAO/ILSI (International Life Sciences Institute). 1997. Preventing micronutrient malnutrition: a guide to food-based approaches. A manual for policy makers and programme planners. Rome/Washington, DC, FAO/ILSI. FAO/WHO. 2002. Human vitamin and mineral requirements. Report of a joint FAO/WHO expert consultation. Rome. Hunt, J. & Quibria, M., eds. 1999. Investing in child nutrition in Asia. Manila, Asian Development Bank. ICCIDD (International Council for the Control of Iodine Deficiency Disorder). 2002. IDD fact card. New Orleans, ICCIDD Communications Focal Point, Tulane University School of Public Health and Tropical Medicine (available at www.tulane.edu/~icec/ aboutidd.htm; accessed end May 2003). International Food Policy Research Institute (IFPRI). 2002. Biofortification: harnessing agricultural technology to improve the health of the poor (available at www.ifpri.org/themes/grp06/papers/biofort.pdf; accessed end May 2003). Mannar, V. & Gallego, E. 2002. Iron fortification: Country level experiences and lessons learned. J. Nutr., 132: 856S-858S. Mason, J.B., Lotfi, M., Dalmiya, N., Sethuraman, K., & Deitchler, M.; with Geibel, S., Gillenwater, K., Gilman, A., Mason, K. & Mock, N. 2001. The micronutrient report: current progress in the control of vitamin A, iodine, and iron deficiencies. Ottowa, Micronutrient Initiative/International Development Research Center (available at http://www.micronutrient.org/frame_HTML/resource_text/publications/mn_report.pdf; accessed end May 2003). Nantel, G. & Tontisirin, K. 2002. Policy and sustainability issues. J. Nutr., 132: 839S-844S. Stover, P. & Garza, C. 2002. Bringing individuality to public health recommendations. J. Nutr., 132: 2476S-2480S. Uauy, R., Hertrampf, E. & Reddy, M. 2002. Iron fortification of foods: Overcoming technical and practical barriers. J. Nutr., 132: 849S-852S. Underwood, B. 1999. Perspectives from micronutrient malnutrition elimination/eradication programmes. MMWR - Morbidity and Mortality Weekly Report, 48: 37-42. United Nations Children's Fund (UNICEF). 2001. Review of the achievements in the implementation and results of the World Declaration on the Survival, Protection and Development of Children and Plan of Action for Implementing the World Declaration on the Survival, Protection and Development of Children in the 1990s. Report of the Secretary General to the United Nations General Assembly, 27th Special Session. New York. UNICEF. 2002. Vitamin A global initiative (available at www.unicef.org/vitamina; accessed end May 2003). USAID (The United States Agency for International Development). 1992. Economic rationale for investing in micronutrient programs: A policy brief based on new analyses. Washington, DC, United States Agency for International Development, Bureau for Research and Development, Office of Nutrition, Vitamin A Field Support Project. WHO (World Health Organization). 1996. Indicators for assessing vitamin A deficiency and their application in monitoring and evaluating intervention programmes. WHO/NUT/96.10. Geneva. WHO. 2001a. 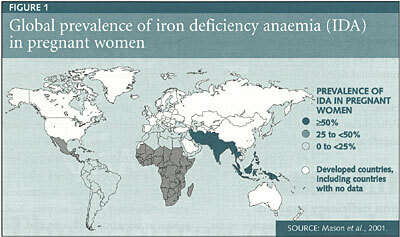 Iron deficiency anaemia: Assessment, prevention and control - a guide for programme managers. Geneva. WHO. 2001b. Assessment of iodine deficiency disorders and monitoring their elimination - a guide for programme managers. Second edition. Geneva. WHO. 2002. Turning the tide of malnutrition, responding to the challenge of the 21st century (available at www.who.int/nut/documents/nhd_brochure.pdf; accessed end May 2003). WHO/FAO. 1996. Preparation and use of food-based dietary guidelines. Geneva. THE MOST RECENT ESTIMATES from FAO indicate that 840 million people do not receive enough energy from their diets to meet their needs. The overwhelming majority, 799 million, live in developing countries. The global toll of persons affected by micronutrient deficiencies is estimated to be even higher and probably exceeds two billion. Micronutrient deficiencies can exist even in communities where the food supply is adequate to meet the energy needs of the population. When people cannot afford to diversify their diets with adequate amounts of fruits, vegetables or animal-source foods containing micronutrients, deficiencies are inevitable. Iron, iodine and vitamin A are the three micronutrient deficiencies of greatest public health significance in the developing world. Other micronutrients have been shown to play a role in preventing specific disease conditions (e.g. folic acid) or in promoting growth (e.g. zinc). Progress in reducing the prevalence of clinical deficiencies has been achieved, particularly for clinical vitamin A and iodine deficiency. The external visible effects of micronutrient deficiencies help to identify the presence of these disorders. However, much more is now known about the insidious effects of subclinical deficiency on child growth and development, reproductive outcome, immune-system function and its effects on risk of infections and work productivity. The focus is thus on the measurement of subclinical indicators to determine and monitor the extent of the problem. Process indicators, such as the number of households using iodized salt, are being increasingly utilized to detect programmatic improvements in control strategies. The three main strategies for addressing micronutrient malnutrition include supplementation, fortification and dietary diversification. Of these, the food-based approaches are considered by FAO as a sustainable means of meeting the nutritional needs of population groups. More attention and support to these strategies is needed. Similarly, it should be recognized that a wider set of factors, including health care, education, sanitation, water supply and housing will influence progress. Complementary public health interventions that can help reduce micronutrient malnutrition include deworming, malaria prophylaxis, improved water and sanitation facilities and childhood immunization. Successful strategies are those which address these issues in an integrated and coordinated fashion. SELON LES ESTIMATIONS LES PLUS RECENTES de la FAO, 840 millions d'individus ne puisent pas assez d'énergie dans leur alimentation pour couvrir leurs besoins. Une écrasante majorité d'entre eux, soit 790 millions, vivent dans des pays en développement. On estime cependant que le nombre total de personnes souffrant de carences en micronutriments dans le monde est en fait beaucoup plus élevé et dépasse vraisemblablement les deux milliards. Les carences en micronutriments peuvent même survenir dans les communautés où l'approvisionnement en nourriture est suffisant pour couvrir les besoins énergétiques de la population. Si les gens, faute de moyens, ne peuvent diversifier leur alimentation et consommer en quantités adéquates des fruits, des légumes ou des aliments d'origine animale contenant des micronutriments, les carences sont inévitables. Dans les pays en développement, les carences en fer, en iode et en vitamine A sont les plus préoccupantes du point de vue de la santé publique. On a également démontré que d'autres micronutriments contribuent à prévenir certains états pathologiques spécifiques (l'acide folique, par exemple) ou favorisent la croissance (comme le zinc). Des progrès ont été réalisés dans la réduction de la prévalence des carences cliniques, notamment celles en vitamine A et en iode, d'autant que les carences en micronutriments s'accompagnent de signes externes qui en facilitent le diagnostic. Toutefois, on en sait aujourd'hui beaucoup plus sur les effets insidieux des carences infracliniques sur la croissance et de développement de l'enfant, la santé génésique, le fonctionnement du système immunitaire, les risques d'infection et la productivité du travail. Les efforts portent donc principalement sur l'évaluation des indicateurs infracliniques, qui permettent de cerner l'ampleur du problème et d'en suivre l'évolution. Les indicateurs de processus, tels que le nombre de ménages consommant du sel iodé, font l'objet d'une utilisation croissante et permettent d'apporter des améliorations d'ordre programmatique aux stratégies de lutte contre les carences. Les trois principales stratégies de lutte contre la malnutrition due aux carences en micronutriments sont la supplémentation alimentaire, l'enrichissement et la diversification des aliments. Selon la FAO, les approches fondées sur l'alimentation permettent de répondre durablement aux besoins nutritionnels propres à chaque groupe de population. Elles méritent donc une plus grande attention et un soutien accru. De même, il faut tenir compte du fait que de nombreux facteurs (soins de santé, éducation, assainissement, approvisionnement en eau et conditions de logement, entre autres exemples) peuvent influer sur les progrès accomplis. Les interventions de santé publique complémentaires axées notamment sur les traitements antiparasitaires, la prophylaxie antipaludéenne, l'amélioration des installations d'approvisionnement en eau et d'assainissement et la vaccination infantile peuvent aussi contribuer à faire reculer la malnutrition due aux carences en micronutriments. Les stratégies les plus efficaces sont celles qui abordent l'ensemble de ces questions de manière intégrée et coordonnée. SEGUN LAS ESTIMACIONES MAS RECIENTES de la FAO, 840 millones de personas no obtienen de la dieta la energía necesaria para satisfacer sus necesidades. La inmensa mayoría de ellas, 799 millones de personas, viven en países en desarrollo. Se considera que el número de las que sufren carencias de micronutrientes es aún más elevado y, probablemente, supera los 2 000 millones de personas. La carencia de micronutrientes puede darse incluso en comunidades en las que el suministro de alimentos es suficiente para cubrir las necesidades energéticas de la población. Ese tipo de carencias es inevitable cuando no es posible diversificar la dieta con cantidades adecuadas de frutas, hortalizas o alimentos de origen animal que contienen micronutrientes. Las de hierro, yodo y vitamina A son las tres carencias de micronutrientes de mayor trascendencia en la salud publica que se producen en el mundo en desarrollo. Se ha demostrado que otros micronutrientes inciden en la prevención de determinados trastornos (por ejemplo, el ácido fólico) o en la promoción del crecimiento (por ejemplo, el zinc). Es cierto que se ha avanzado en la reducción de la prevalencia de carencias clínicas, particularmente en lo que respecta a la vitamina y el yodo. Los efectos externos visibles de las carencias de micronutrientes contribuyen a determinar la existencia de esos trastornos. Sin embargo, hoy en día se conocen mucho mejor los efectos insidiosos de la carencia subclínica sobre el crecimiento y desarrollo de los niños, la salud reproductiva, la función del sistema inmunitario y sus efectos sobre el riesgo de infecciones y la productividad laboral. La atención se centra, pues, en la medición de indicadores subclínicos para determinar y vigilar la amplitud del problema. Para establecer las mejoras programáticas en las estrategias de control se utilizan cada vez más indicadores de procesos, como el número de hogares en los que se consume sal yodada. Tres estrategias básicas para afrontar la malnutrición relacionada con los micronutrientes son la suplementación del régimen alimenticio, el enriquecimiento de los alimentos y la diversificación de la dieta. La FAO considera que los enfoques basados en los alimentos constituyen un medio sostenible de satisfacer las necesidades nutricionales de los grupos de población. Es necesario redoblar la atención y el apoyo a esas estrategias. Hay que admitir, también, que otros factores como la atención sanitaria, la educación, el saneamiento, el abastecimiento de agua y la vivienda influirán en los progresos. El tratamiento vermífugo, la profilaxis del paludismo y la mejora de los servicios de abastecimiento de agua y de saneamiento y la vacunación infantil son intervenciones de salud pública complementarias que pueden contribuir a reducir la malnutrición relacionada con los micronutrientes. Las estrategias satisfactorias son aquellas que afrontan esos problemas de forma integrada y coordinada.